These are just some of the dozens of reasons why people choose not to work out. First the little excuses start to build and then all of a sudden you’re stuck in a rut and don’t even know where to begin. Back in high school I never worked out on my own. I think that’s the case for many people when they’re younger–they rely on team sports to get their exercise. Those days were great, but eventually it becomes your own responsibility to keep your body healthy. 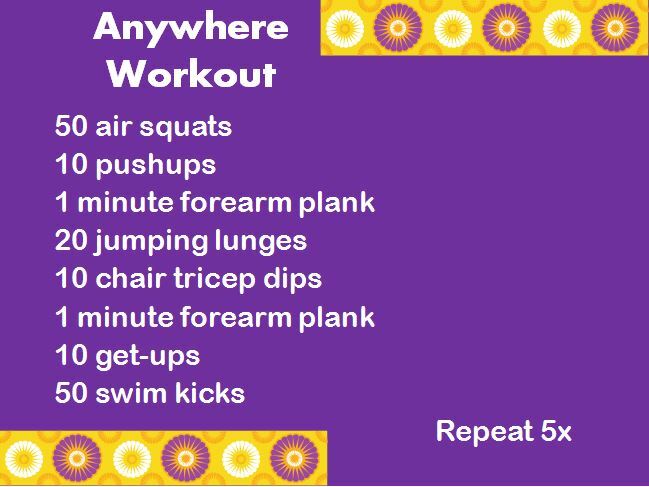 Today I created a quick workout that you can do anywhere. You don’t need equipment except your own two feet and it won’t cost you a cent. Plus, it’ll be done in 20 minutes or less, so even if that means setting your alarm a little earlier or squeezing this in on your lunch break, it’s possible. Feel free to give this a try on one of those days when you just don’t feel like heading to the gym. Make sure to blast music–that always makes workouts so much more enjoyable for me! For a point of reference, “get-ups” involve laying on your back, sitting up and standing without using your hands to support you. For swim kicks, lay on your stomach and extend your hands forward like you’re reaching for something in front of you. Then move your arms and legs up and down, never letting them touch the ground. If this workout seems too challenging for you, scale it back! There’s nothing wrong with scaling a workout down to your fitness level. Do your pushups on your knees, do walking lunges instead of jumping ones, or only hold your plank for 30 seconds. Just don’t look at a workout and give up on the whole thing because a few of the moves look too difficult. Work your way up! That looks like a great at home workout – David and I always do a home workout on a Sunday, will give this one a try this weekend! Thanks!